The conference on Saturday was well attended and provided a much needed opportunity to talk through the issues and increase our ability to campaign effectively to overturn this derided government policy. 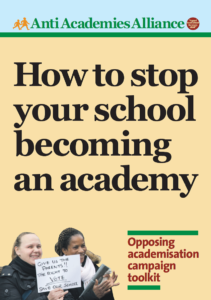 When we started the Anti Academies Alliance, a decade ago, we warned that this scheme was about the break up of state education and the attempt to privatise our schools. We take no pleasure in saying that the evidence has proved us right. 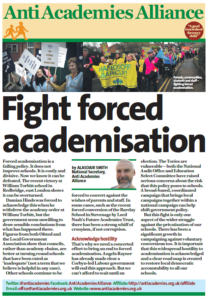 When we started there was a small group who passionately campaigned against academy status. 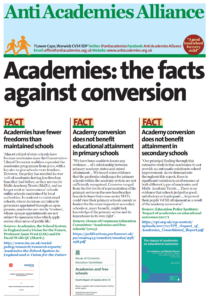 Now the views we were advocating then are much more commonly accepted and there is a wide audience for the argument that the academy and free school movement should be stopped and reviewed before more harm is done. An emphasis on uniform, hair styles and discipline.We have seen schools where large numbers of pupils are sent home, or pupils are excluded for their haircuts, uniform or shoes. An attempt to break up and weaken trade union recognition and organisation and consequently an increase in workload, working hours and the length of the school day. A reduction of the wider curriculum and an increased emphasis on testing. An increase in exclusions and selection. An increase in financial investigations into misuse of funds and lack of financial oversight and accountability. There have been some high profile cases of the use of school money for dubious purposes. There was the school which used funds to purchase a Vera Wang fine china tea set, the schools where a head teacher, formerly a head teacher of the year, who received an OBE for services to education, who was found to have spent school money on her own birthday party, amongst other things, and as a consequence was given a lifetime ban from teaching. The recent grilling at the public accounts committee exposed that the Head of Durand academy trust, paid over £400,000 per year, had opened a dating agency from the school premises. Margaret Hodge asked him how a busy Head teacher could find the time to run a dating agency. What also emerged was a blurring of the rules with regards to the trust paying corporation tax. The report widely publicised by the education select committee at the end of January 2015, concluded that there was no evidence that academies raised standards. Although the Tory chair, Graham Stuart, tried to qualify that there was no evidence ‘yet’, it is clear that for most people, ten years is enough to conclude that the evidence is overwhelming proof that the project has failed to improve standards. Cameron announces more academies as part of his election promises. Despite the wealth of evidence, David Cameron has pushed ahead with the Tory plan to increase the number of academies, threatening that schools with a ‘requires improvement’ judgement would be forcibly turned into academies, in his recent announcement. There is a question mark over the ability of the government to find 3,500 Heads willing to take on such a challenge. Local campaigns are springing up all over the country including in some sleepy towns like the campaign in Oxted. where the parents marched through their town centre and are fighting hard for a choice – ‘give us a ballot’ is their demand. If the message from government is that schools deserve autonomy, choice and freedom, why not give them the choice to return to, or stay with, the local authority? There are many unions in education and many campaigns. 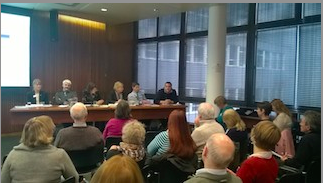 The key for us is to join forces and harness the power of our movement to make the fight to save state education as high profile as the campaign to save the NHS. The conference was a useful step in this direction. The AAA will be working up to and after the general election to make sure that academisation is high on the agenda for politicians and voters alike. We hope to post reports from the wide range of speakers and from the workshops in the coming days.